Handmade construction and attention to detail with a solid mahogany top, soft cutaway and active electronics. CÃ³rdoba ukuleles capture the charm of traditional Portuguese ornamentation and exotic woods. 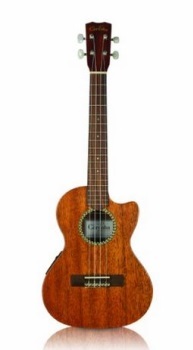 Completely handmade, the 20TM-CE is a tenor sized ukulele with a solid mahogany top and mahogany back and sides. It features a soft cutaway and CÃ³rdoba electronics so that you can plug and play right away.